The first J.I. flyer I saw on the post outside my front door. 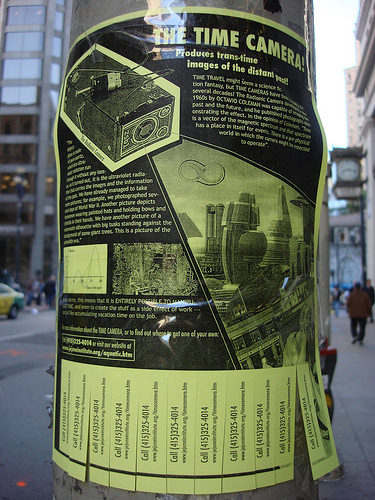 (07 APR 2009) I went out my door into the San Francisco SoMa a few weeks back and for blocks and blocks I saw all these different posted flyers for this thing called The Jejune Institute. The first flyer I saw was for something called a Time Camera, a device which The Jejune Institute claims to be able to film ‘outside of the current temporal phase’. According to them there exists a pre-physical world in which the Time Camera “might be expected to operate”. The next flyer told of a Memory To Media Center process in which one’s memories and even recalled dreams could be transferred to VHS videotape (and VHS videotape ONLY). And by the third flyer which was about their Aquatic Thought Foundation dedicated to the study of human-to-cetacean brainwave interaction (or human-to-dolphin/whale communication). I knew that no matter how serious these folks were, there were too many parallels to my own work on Project ALTER MAN 47 to ignore. So I checked out their website and had a look at the other “products & services” that they had to offer. In addition to the ones mentioned above, there is Polywater (think: Water 2.0), Vital Orbit (a human-generated Forcefield), Moonlight Menagerie (an extension of the Aquatic Thought Foundation for more earth-based critters… think: Magical Familiars), and lastly The Algorithm (which they say is something like a ‘conflict dissolution device’). Now all this stuff may sound pretty fringe and even comical, and I’m still not quite sure what to make of it. I do know that every one of those seven things that The Jejune Institute is promoting also has direct, obvious, indisputable parallels to AM47, as reflected in the dream-vision that I had back in mid May 2007. That was one of the most vivid dreams I have ever had that I was able to have such strong recall. And if you’ve read the rest of my tale, you may come to understand why. And that that dream should jibe so deeply with this Jejune Institute… this warrants further investigation. Apparently The Jejune Institute offers a free induction into the Jejune Method wherein “you will then be handed a key to the future.” Yeah, so, I want to go and set an appointment… does anybody want to go with me? Seriously, someone come with me. Like, this month. Now. Contact me!